Hi to all those who feel the call to remember the skills of ancient wisdom. During these 3 days, you will learn the art of the vision quest, experience a vision quest for yourself and have the material to take away so that you can continue to create these experiences simply at home or with friends. The time in vision quest really allows us to switch of to the distractions of our everyday lives, so that we can begin to listen to the quieter inner voice that has some answers or advise for us based on where we are in life right now. So whether you are looking purely for a retreat to slow down or you are longing to see more clearly a direction on your life’s path, come and participate. 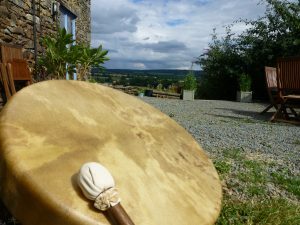 For more information about Les Vallees please see www.lesvallees.co.uk/shamanic-courses.hdm or contact Margaret or myself at either margaret@lesvallees.co.uk or nicky@everydayshaman.uk. I would like to join you for your vision quest please and I will contact Julie Price to ask if she would care to join me. Please could you mail your pay pal details for me to transfer payment. Also if you would be so kind to advise what route I need to take on Eurostar I would’ve extremely grateful. Great to hear from you. Margaret will be in touch shortly regarding the details re payment and travel specifics.